David Conn begins his exhaustive chronicle of FIFA's recent sordid affairs on an uncharacteristically bright note, spending the first chapter describing how he was enraptured by the 1974 World Cup as a 9 year-old. Every four years the World Cup comes around and mesmerizes and brings joy to fans across the globe and reaffirms that soccer is at its core a game designed to offer pleasure to players and spectators. 1974 marked a transitional year for the sport's global governing body, FIFA, as Brazilian business Joao Havelange won the presidency over Englishman Stanley Rous, who embraced a purer, less commercial approach to soccer. 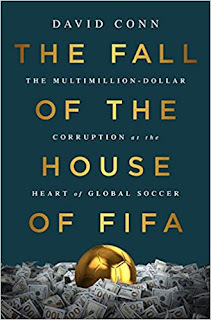 In The Fall in the House of FIFA, Conn gives an exhaustive account of FIFA's indiscretions over the last 40 years and describes how the organization strayed from its humble beginnings. Conn reported on much of FIFA's recent misdeeds, including corrupt bidding processes for the World Cups in Qatar and South Africa, misappropriations of development funds for domestic Football Associations, rigged presidential elections, and the like, for The Guardian and serves as an able guide through FIFA's bad behavior. Conn's book is an authoritative tome on FIFA corruption, though it occasionally gets a bit dry. I would put it front and center of the syllabus of any college course on the dark sides of Swiss-based international sporting organizations worth its salt, but it can become a grind for the more casual reader. Given the massive sponsorships and television audiences attracted by global soccer today, it is remarkable how modest FIFA's origins were. Formed in 1904 in the backroom of the Union Francaise de Sports Athletiques building in Paris, FIFA started with only 7 members (with snooty England sitting out) and was designed for the express purpose of facilitating games between nations. Somewhat ironically, FIFA ruled that "no person should be allowed to arrange matches for personal profit." Over the years, FIFA would morph into a sporting and economic juggernaut, consisting of over 200 nations (as anyone who has ever been exposed to one iota of FIFA's self-congratulatory behavior already knows, the organization features more members than the United Nations). Conn tracks the evolution of the organization and the figures who shaped its trajectory. While Conn peppers in a few on-field accounts of various World Cups, much of the action in his book takes place in backrooms, hotel rooms, and offices, and he focuses mostly on off-field affairs. The meat of Fall in the House of FIFA understandably centers around the organization's nadir that had its roots in its initial forays into mega-sponsorships with a deal with Coca Cola in the early 70s and eventually culminated in Sepp Blatter, Jack Warner, Chuck Blazer, and other FIFA officials' downfalls over the last few years. Blatter took over from Havelange in 1998 running against a more reform-minded candidate, and winning the election under rumors of vote-buying. While Qatar's successful World Cup bid was the last straw for Blatter and is probably the misdeed most familiar to Americans likely still sore over losing hosting rights, Blatter's term was marred by a plethora of other problems, including funneling/bribing local FAs with humongous sums of money for grassroots soccer. Blatter did not act alone and there are substantial chapters devoted to other major players such as CONCACAF executives Chuck Blazer and Jack Warner and UEFA President Michel Platini. Conn is evenhanded with his writing, acknowledging the good that these officials did to promote the sport in their regions in spite of their less-magnanimous activities that earn the most of his attention. The book reads like an extended investigative newspaper article, meticulously researched with ample detail, though it can begin to feel like a slog if you are less interested in reading about political corruption. I wish there was more analysis into the psyches of these executives and what compelled them to take bribes and otherwise behave poorly, but in Conn's defense the vast majority of his subjects have clammed up and aren't willing to divulge much at all, basically leaving him stuck detailing the "what" over the "why." Conn does offer some analysis on what mechanisms helped facilitate FIFA's corruption, including the odd voting policies that often granted nations such as Montserrat (population 4,900) just as much voting clout as Germany. The book ends on an especially strong note with an extended interview with Sepp Blatter. While Blatter was evasive and guarded when Conn reached out to the former FIFA head earlier in the book, he is far more open to the author in his later interview, reflecting on his tenure and final days as president. He's not the most regretful person in the world and still makes some effort to protect his character (though it's safe to say he's probably ruled out ever winning the Nobel Prize by now) but it's still a good read and was the highlight of the book for me. Overall, your enjoyment of The Fall in the House of FIFA is going to depend on how interesting you are in the subject. If you are looking for a one-stop book that outlines the history of FIFA and an encyclopedic account of its recent corruption and the fall of Sepp Blatter, you'll probably love the book. If you are interested in soccer as a sport as well as an economic and sociological phenomenon but you aren't that keen on reading about FBI investigations and accounts of executives behaving badly, then I'd advise you to stay away. 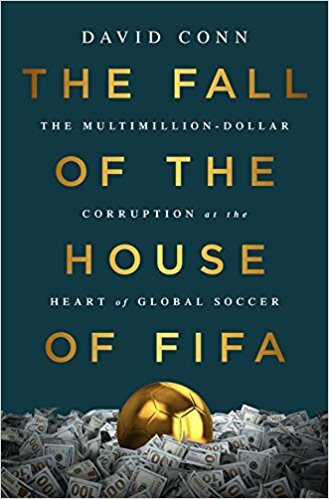 Having said that, The Fall in the House of FIFA deftly accomplishes what it set out to do and is an authoritative and informative account of FIFA's recent activity.